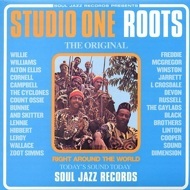 Studio One Roots is an important collection of some of the deepest roots music to come out of Studio One Records, Reggae's most important record label ever. This release features many rare and classic tracks that have been unavailable for over thirty years. As Soul Jazz Records continue to delve into the largest Reggae catalogue in the world, this release is literally ram-jam packed with classics that you cannot find elsewhere. Whilst Studio One led the field in all forms of Reggae, this collection shows how the depth of its roots music outshone all others.